Stock photo of the beautiful St. Katherine's Church, Katharinenkirche, and the night life of downtown Frankfurt at dusk, Hessen, Germany, Europe. Night time at the St. Katherine's Church and downtown Frankfurt, Hessen, Germany, Europe. 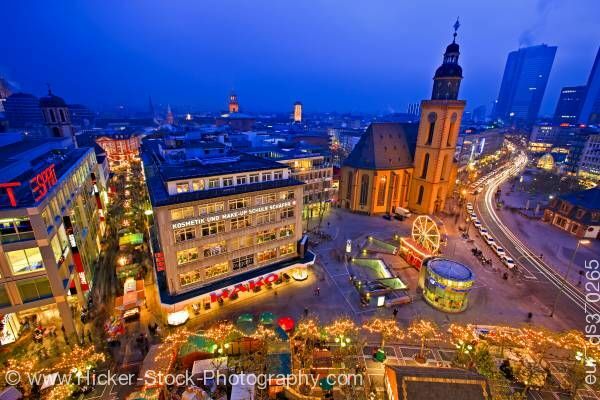 This stock photo shows the unique St. Katherine's Church, Katharinenkirche, and the night life of downtown Frankfurt at dusk, Hessen, Germany, Europe. The distinguished St. Katherine’s Church stands out among the downtown night life in a golden glow with its unique architecture and the tower dominating the scenery. Dazzling Christmas decorations are seen throughout the town. The foreground shows a row of trees with white lights wrapped among their branches. A Ferris wheel is seen in the parking lot in front of the church. Office buildings, stores and the streets are lit with the activity of night life. The backdrop is a deep blue cast with the sky and some of the buildings blending together. St Katherine' s Church, Katharinenkirche, and downtown Frankfurt at dusk, Hessen, Germany, Europe.